Currently I'm writing to you from Budapest, which I just learned is also referred to as "Paris of the East." Funny I never heard this before, since I lived here for a period of 3 months in 2014, but hey, I guess that's the thing about travel: there's always something new to discover. After having said goodbye to my incredible travel companion this morning, teary eyed and all, I can't help but go back two weeks in my mind and revisit where this journey started: Paris. We arrived after a red eye flight, which wouldn't have been such if it weren't for the time difference, incredibly tired but even more starving. 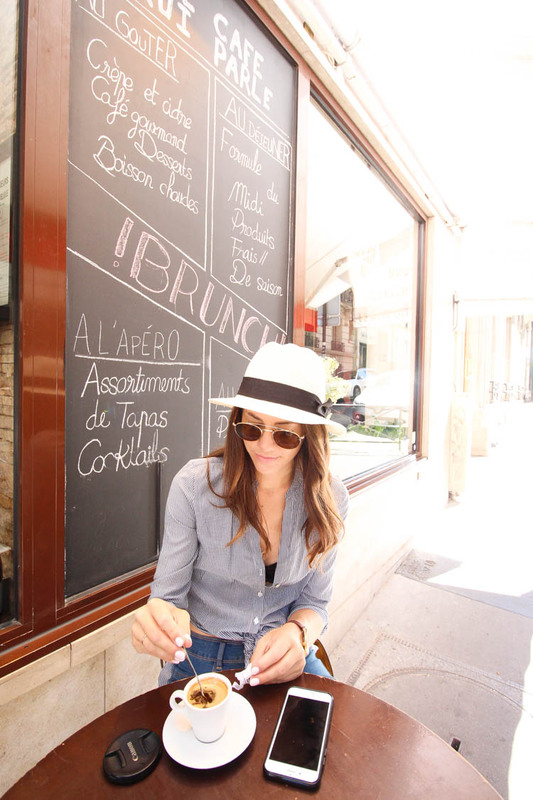 Our hunger briefly conquered our need for shut eye, so after we checked into Hotel de Nell (an amazing, romantic paradise with that little Parisienne terrace I've always dreamt of) we wandered out to the nearest cafe to fill our stomachs. We both order Croque Madame and sat in a delirium, trying to have a conversation amidst our significantly delayed processing and response times. There's so much I can divulge about our three days in Paris, from our nighttime climb to the top of the Arc de Triumph (avec hidden champagne toast) to our wonderful, elite dining experience at the Peninsula Hotel's Le Lobby restaurant to the day we spent roasting in the sun, exploring the gardens at Versailles Palace. But even though there were so many romantic, magical moments had in the City of Love, I think it were the small ones that I enjoyed most: riding the metro, passing by street musicians, having a cigarette and an espresso... en francais. Featured in this video: The most amazing/clutch wallet that is perfect for traveling by my girl at STIL Classics, as well as our stay at Terrass Hotel and our dining experience at Le Lobby.